There is a lot of changes in this version. Now you can create almost any kind of rhythms with 6 independent note divisions which you can assign your choice of music note, polyrhythm setting, tuplet setting or a sequence you created in conjunction with improved beat control. Coach function has been improved as well, you can save unlimited number of your coach settings. Campatible with iPhone,iPod and iPad. Supper accurate multi division programmable metronome—Almost any kind of complex rhythms can be built up easily with six independent note divisions in conjunction with Multi Beat function. 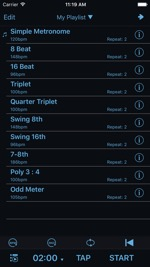 You can assign your choice of music note, polyrhythm setting, tuplet setting or a sequence you created to each division. All settings can be saved for later recall and stored in a playlist. Coach function, built in Loop Timer, tuning tone generator, pendulum animation and flashing function will help your practice. • 6 independent note divisions. • Assign your choice of note value, polyrhythm setting, tuplet setting or a sequence you created for each division (except Beat division). 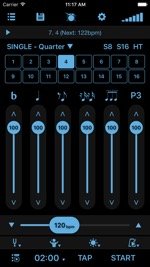 • Volume slider and mute buttons for each division. • Assign your choice of sound sample from preset sounds or your own sounds for each division. • Multi beat mode—you can set up to 64 beats per cycle with the beat sound on any selected beats to create complex rhythms. Playback velocity for each selected beat can be adjusted. • All of your setting ,including BPM and sound for each division, can be saved for later recall and stored in a playlist. • Sound-Set—Create a set of sounds for quick sound change. • Coach functions—Gradual up down / Quiet count. Unlimited number of settings can be saved. • Visual effects—Pendulum animation and flashing screen. • Adjustable swing feel functions. • Tuning tone generator—adjustable frequency and note. • Sync library and settings on multiple devices via iCloud. • Appearance can be adjusted to suit your taste.